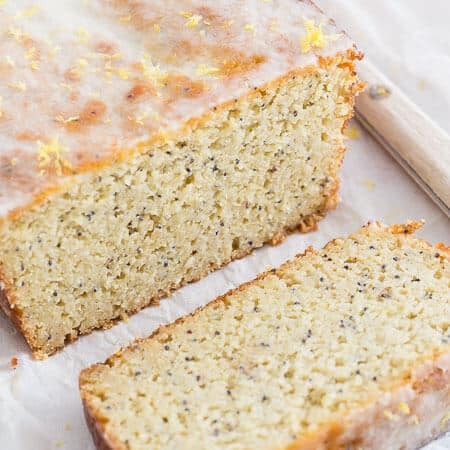 This paleo lemon poppyseed bread is incredibly moist and topped with a lemon glaze for a delicious grain free treat that’s great as an afternoon snack. Watch the video below to see how to make this easy paleo lemon poppyseed bread. I’m pretty sure I have an addiction to chocolate. Every afternoon, after I eat lunch, clean up and put the kitchen mess of the day away, I can only focus on one thing: chocolate. Whether it’s a piece of dark chocolate from my stash of bars in the pantry, a handful of chocolate chips from the bag, a spoonful of Nutella, or a slice of this paleo chocolate zucchini bread it HAS to happen. The problem, however, is once I eat whatever a respectable serving would be of any of those options, I eat more. And then some more and sometimes, even a little bit more. It’s like I can’t stop and I’m pretty sure it’s the closest (if not actually the real thing) I’ve ever been to having an addiction. So in my brilliant mind the best way to get rid of this little afternoon sugar addiction is to just replace it with another. Hi there, paleo lemon poppyseed bread. If you’re looking for other paleo breads check out this paleo almond zucchini bread, this almond coconut banana bread or, (one of my favorites) this pumpkin streusel bread. For as long as this remained on my kitchen counter, all chocolate cravings disappeared. I wouldn’t have thought lemon had such powers but this bread with it’s slightly tart, slightly sweet, super moist and oh, grain free-ness did. I’ve never been so proud of a paleo baking experiment as I am with this loaf. It’s everything I want out of bread period, let alone paleo bread. No weird sinking in the middle or oddly small loaves. No dark/burnt looking interior. No need for half a dozen eggs (super pet peeve of grain free baking). No need for a special order off Amazon for the ingredients. Coconut flour is pretty much everywhere these days but if you can’t find cashew meal, simply buy some unroasted, unsalted (aka plain) cashews and process them until finely ground in your food processor or high speed blender. I love using my Vitamix for this. 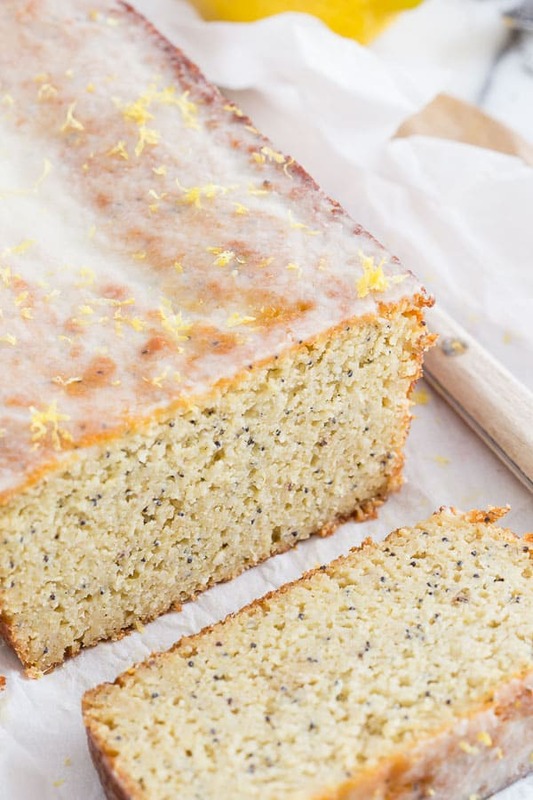 This paleo lemon poppyseed bread is made with cashew and coconut flours. 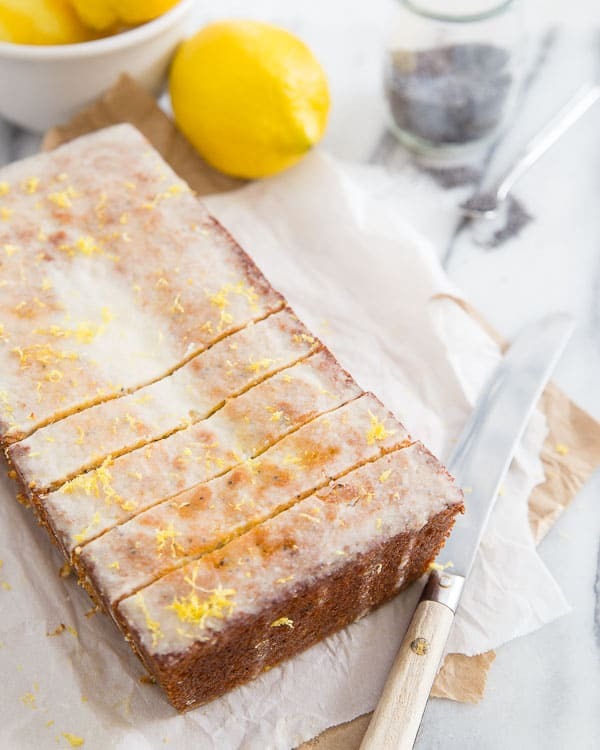 It's incredibly moist and topped with a lemon glaze for a delicious grain free treat. Preheat oven to 360 degrees. (Yes, 360. I like a baking temperature between 350 and 375 for paleo baked goods) and grease a loaf pan. Combine the flours, baking powder, baking soda and salt in a large bowl. Whisk together the eggs, coconut oil, honey, lemon juice, lemon zest and almond milk in another bowl. Add the poppyseeds and mix again until thoroughly distributed in the batter. Pour into the greased loaf pan and bake for about 40 minutes until the middle is set and the top/edges start to turn golden brown. Remove the bread from the oven, let cool a few minutes in the pan before turning out onto a cooling rack to cool completely. Combine all the ingredients in a small bowl. Heat just slightly in the microwave so that the coconut oil and coconut butter melt/soften enough to whisk everything together into a smooth mixture. Set aside and let cool back to room temperature, as it sits and cools it will thicken a bit. You can also set it in the fridge for a few minutes to speed the process up. Once the bread is cooled completely, drizzle the glaze over the top of the bread and let it set. 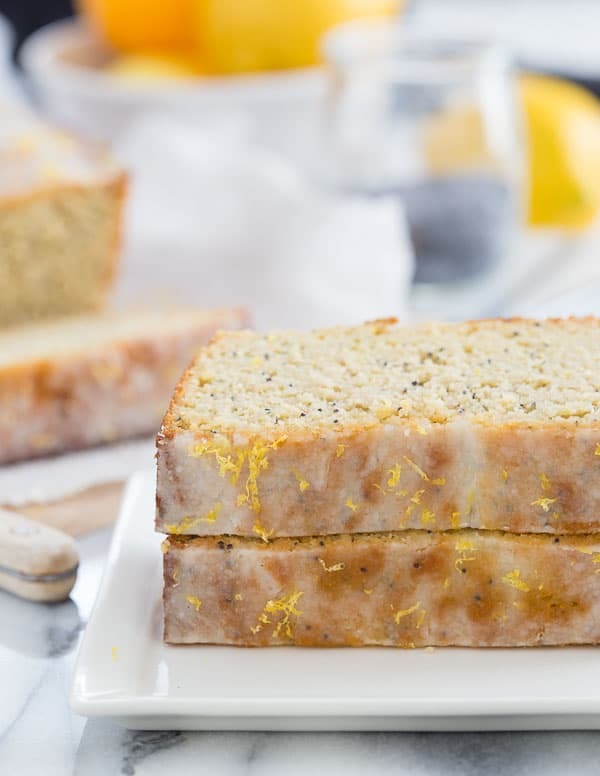 I can’t wait to try the Paleo lemon poppy bread! I’m in a group of women who do Paleo and they will love this recipe. I’m going to share it on my foodhuntress facebook page. This looks absolutely delicious Gina! That lemony glaze is calling out to me. I love my bread, all kinds and flavors and can’t wait to give this a try! Yum! I’m sooo making this. It looks amazing. And I love that it uses cashew meal!! I intend to give your recipe a try – I don’t have gluten issues, and don’t follow any specific type of nutrition system, but I always enjoy stretching my horizons and experimenting with different types of flour in baking. For the most part, gluten free breads and muffins disappoint me in terms of texture, but with your endorsement of this recipe, I feel I need to give it a go. Also intend to look at the other one you recommend, the banana almond coconut bread… flavors I love! I love this bread! So awesome that it’s paleo, looks beautiful, and doesn’t you a dozen eggs! My sister is gluten-free and I’ve been looking for a good GF lemon poppyseed cake! Definitely saving for later. It sounds amazing! Perfect for this weekend. Summer is just starting where I live and this bread sounds really fresh. This is my girls’ favorite quick bread, can’t wait to try this yummy version! Would substituting flax “eggs” for eggs work in this recipe? I would like to make it for a family gathering, however my niece has an egg allergy. If not flax “eggs,” are there any other egg substitute recommendations? I haven’t tried it but would not recommend it. Paleo baking is temperamental enough as is. While flax eggs usually work fine in traditional recipes, I just don’t trust them replacing all the eggs in this due to the nut flours. Do you think almond meal would work as a sub for cashew meal? My TJs does not have the cashew meal. Yeah, I’m betting that would work. If you use the TJs almond meal, since it’s not blanched, the bread will probably turn out darker, just an FYI. OK, thanks! This looks delicious. I live in Canada, so no Trader Joes. :( I am going to have to try this with almond meal; it looks unbelievably good and is calling to me! You can also make your own cashew flour by processing cashews in the food processor until fine. I couldn’t find cashew flour either so I put one and a half cups of raw cashews in the food processor for about 30 seconds and used that. It Worked well. The bread turned out lovely, wonderful flavour! It is moist and dense and would well as a cake too. Ahh just saw comment above mine! It’s me again! I tried the bread with almond meal and the results were not as good as what I see here. I will try it with homemade cashew meal next time! Curious…what about it didn’t turn out as good? The almond meal sub is probably going to be a recurring question so I’d love to know what the result was like. The texture was a bit too coarse with the almond meal. The batter seemed very wet after mixing. And the outside got quite a bit darker than your bread. Maybe if the almond meal/flour was more finely ground and/or I added a bit more coconut flour, the results would have been better. This is THE GREATEST BREAD in history. I made one batch to give as a gift but it was too delish, so my hubby and I ate it all. I made another batch for brunch guests today and they adored it!! This bread is so moist and perfectly dense. Not too sweet, not too overpowering. Just perfect. I have been searching for the perfect cashew flour bread and found the best ANY FLOUR BREAD. I hope my overuse of caps properly conveys my excitement. I ran out of coconut oil so I used 1 tbsp coconut oil + 1 tbsp coconut butter + 2 tbsp olive oil. For the second batch I tried mandarins instead of lemons, which was also amazing. Give it a whirl! Thank you for this! So there’s someone else out there as addicted as I am!! I’ve worked my way up to 100% dark so there’s less guilt involved, but I can no longer wait until lunch. I typically start on my 1-1.5 ounce daily allowance after breakfast :) Can’t wait to try this bread. Looks delicious! Hi! I have an allergy to cashews – can this be made with almond flour instead? Thanks! Blanched almond flour should work well as a substitute. Can I use palm shortening in place of the coconut butter? I haven’t tried that, not sure. Does it matter if the loaf pan is glass vs non-stick? Do you suggest one over the other? It shouldn’t as long as it’s greased well. This looks amazing! Do you think I could easily sub almond flour for the cashew flour? Hubs is allergic to cashews but I’d love to try this recipe! Omg! It’s soooo good! It’s better than the Starbucks loaf! My family devoured it and now making a second loaf …maybe 3rd while I’m at it ????. Thanks for sharing Gina! Could I use all coconut flour Instead of the cashew flour? No. Coconut flour can’t be substituted 1:1 with other flours, it’s very different and way more absorbent than other flours so the liquid to dry ratio is completely different. Do you have a carb and calorie count for this? I don’t. You can plug the recipe into any nutritional calculator online though to get that information if you need it. Hey Gina, can’t wait to try this recipe! Can I check what size loaf pan did you use? It’s about a 9×5, slightly under in both measurements. This recipe is amazing! It covers almost all of my family’s dietary issues. However, there is one snag, my father can’t have eggs under any circumstances, and I was wondering if you had any ideas for a substitution that would work. Thanks! I haven’t tried any egg substitutions in this recipe and tweaking things like that with temperamental paleo flours can be tricky. You could try a flax or chia egg but I can’t say if it’ll work or not, sorry! Good evening, how many carbs does it have?